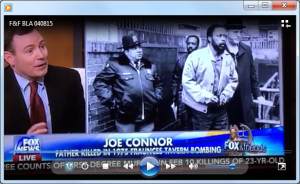 On Fox & Friends April 7, Brian Kilmeade and I discussed the absurd and dangerous New Jersey appellate court ruling to release a convicted Black Liberation Army cop killer because “he blacked out” claiming he cannot remember his role in Officer Foerster’s murder. We have seen too many releases of terrorists. From Islamic Extremists at Guantanamo Bay to the Marxist FALN members who killed my father to the push to release Mumia Abu Jamal, Oscar Lopez Rivera and now BLA member Clark Squire our courts and politicians are playing Russian Roulette with the safety of the American People. Please click here or below for the full interview. This entry was posted on April 8, 2015 at 10:32 pm and is filed under al qaeda, Bill Ayers, Bill Clinton, FALN, FALN Terrorists, Fox & Friends, Fraunces Tavern, Guillermo Morales, Islamic Terrorists, Joanne Chesimard, Justice, Marxist, Melissa Mark-Viverito, National Security, Oscar Lopez, Oscar Lopez Rivera Clemency, terror, Terror Trials, terrorism, The New Founders, We Win America, William Morales. You can follow any responses to this entry through the RSS 2.0 feed.